Lakeland Amateur Radio Club: Four Very Happy Faces! Four tested, four passed! A happy day for everyone. Starting at the top Ernie, KG4YNI, congratulates Aubrey KJ4ODY on his new General Class License. 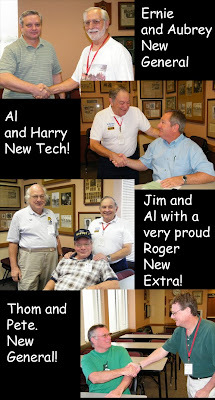 Next, Al, K2RXD, congratulates Harry on passing the Technician Class Exam. Great work Harry. Be sure to join us on the net this coming Thursday and show off that new call sign. Jim, AI4LE, and Al, K2RXD, congratulate Roger on passing the Extra exam. Roger, KI4YQT, no stranger to the club, has earned some EXTRA bragging rights. Good job! Last but not least, Thom, KF4I, congratulates Pete, N2OCF, on passing the General Class License Exam. Despite some health issues, Pete never gave up, and his persistence and hard work paid off. Other VE's present were Mike, KT2T, and Bill KI4ZMV.